British techies will boast that the origins of television can be traced to a room above a shop in Hastings ( blue plaque ) where John Logie Baird constructed the first TV receiver—generating moving images on a mechanical principle. Americans, however, will argue that their man, a certain C. Francis Jenkins, who was also involved in cinema technology , was doing almost the same thing six months earlier in1923. Unfortunately, neither of these pioneers can be said to have invented the television that we tune into today. Most of the credit for that probably belongs to Philo Farnsworth, the farmer’s son from Utah who in 1927, aged 21, produced the first electronic image. So, whatever way you look at it, the Americans invented television, just as they invented rock music. 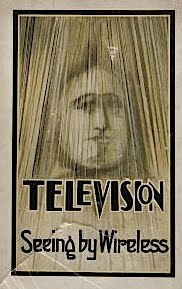 Most of the collected works on early TV appeared before 1930. 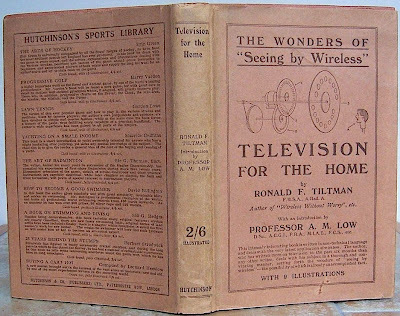 The first book on TV alone was Alfred Dinsdale’s well-known Television, or seeing by wireless (1926). For such a seemingly rare book (‘a rather rare book’, according to one dealer, who wants a toppish £2,490 for his copy) there are quite a few on ABE, ranging in price from a reasonable £350. Personally, I don’t see much point in paying an extra £2,000 or so for an especially good copy of what is essentially a superannuated pamphlet. 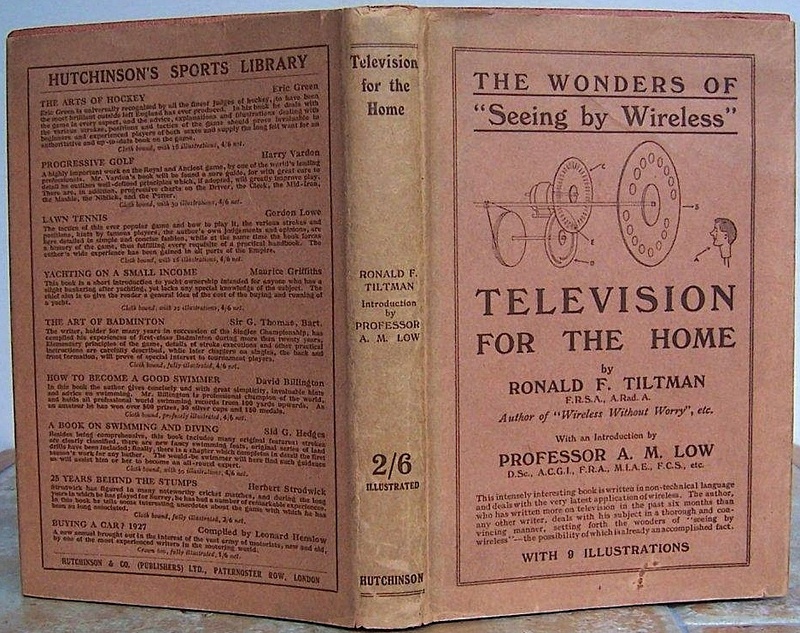 The second significant work, which appeared a year later is Television for the Home by Ronald Tiltman, whose frontispiece show the author being televised by John Logie Baird himself. Recently , there was a very nice jacketed copy of this on ABE for a sensible price. For its technical content alone, this seems a rather better investment than Dinsdale. However, if you hanker for a Dinsdale and can’t afford his Seeing by Wireless you could target a copy or a run ( if you can find one ) of his genuinely rare Television Journal (6d a month), whose July 1929 cover rather hopefully looks ahead to a time when the family might gather around the box of light on a winter evening--an extraordinary image for 1929, when radio was still in its infancy and TV broadcasting was several years away. The more common Book of Practical Television (1935) by G. V. Dowding, an electrical engineer, is a pretty comprehensive technical exposition of 320 pages and many fascinating illustrations, which compares the mechanical and electronic versions of television and places them in a historical context. It even suggests how an enthusiast might build his own receiver. I paid a mere £1.50 for my copy a few years ago, but you’d be lucky to secure one for under £30 now. For historians of TV, issues of the Radio Times from c 1934 are valuable sources of information and can still be had for a few pounds. Copies of The Listener from 1936 to 1939 are equally useful and much cheaper still. Of the latter, look for transcripts of the live discussions by such pre-war TV pioneers as John Piper and Geoffrey Grigson--- and search out the wonderful set-to in 1939 between Grigson and Wyndham Lewis speaking on the side of modern art and the anti-modern defenders of the establishment. Pre-1939 copies of the BBC Yearbook, are also worth seeking out for about £10 each, though I’ve can’t recall ever finding a copy. Still earlier mentions of television in literature are welcome via the comment box. Off topic but like to point out to those who don't know that Ring Lardner Jr and several other blacklisted American writers weote for that Robin Hood series. What next? Early books on PCs, Macs? And smartphones are supposed to be replacing PCs - wonder if anyone will be buying books on smartphones(if such things exist) in 60 years? ?